Sweet songs carried on a jazzy groove with sprinkles of folkiness - deceptively simple songs, ethereal vocals, dreamlike mellow music. From early folk roots, through rock and punk via jazz lounges and Irish pubs, Jeannie has found the boys, and with them put together an album of her own songs. With Paul Russom on keyboards, bass, and general musical genius, Paul Johnson on drums, Tony Brown on saxes, Charlie Morgan on electric guitar and featuring Megan Brown on trumpet, the album seems to defy comparison with other bands, and with Jeannie's beautiful ethereal vocals the deceptively simple songs take on a rare dreamlike flavour. These days, due to shifting fault lines, a Jeannie and the boys gig is quite a rare occurrence, but still happens when separate realities coincide. 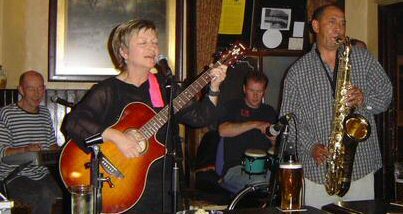 Jeannie and Tony can be found playing unplugged around Yorkshire and the London area. Otley, West Yorkshire - England.